Bravo Ready to Drink for UK Distribution – 5* food hygiene rating achieved. Please note this is a ‘made to order’ service. To create Bravo Non Diary ‘ready to drink’, straight from the pouch. 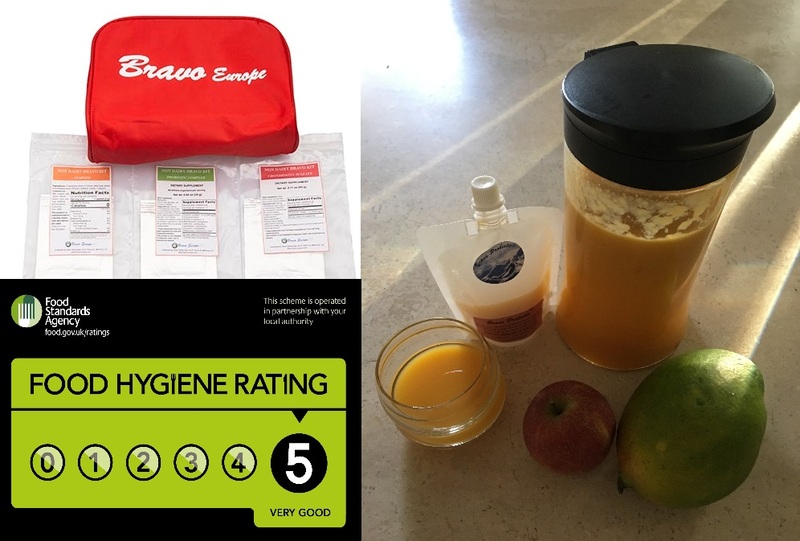 We take a 1-week supply of Bravo dried powders, and carefully prepare and package Bravo ‘ready’, using a recipe of mango and apple in our 5* food hygiene rated kitchen to produce a 10 day supply of the of the adult recommended daily amount (100ml). 10 x 100ml BPA-free resealable pouches. Please select the ‘Special Delivery Chilled Product’ option from the shipping menu. 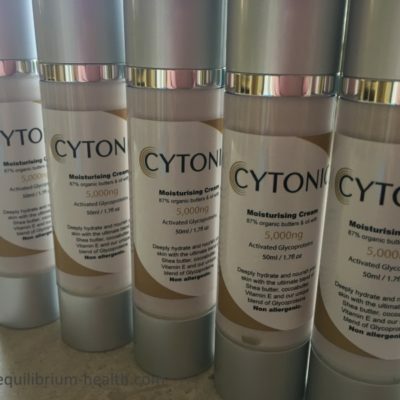 One of the ironies we come across most is that those who may be able to benefit most from adding Bravo to their health regime, are also those who may be too ill or fatigued to contemplate making Bravo for themselves. We can help by freshly preparing Bravo Yoghurt for you as a ‘made-to-order’ service and sending it portion packed by overnight chilled Royal Mail special delivery. 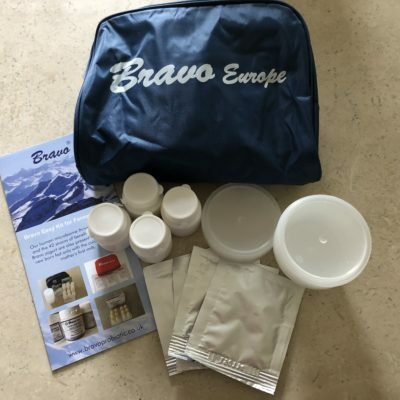 From a 1-week supply of Bravo Non Diary dried powders, we will carefully prepare your Bravo ‘ready to drink’, and package it into 10 x 100ml BPA-free resealable pouches. The timing is strict to provide you with the maximum shelf life for your product of ten days. Designed specifically based on the science of chondroitin sulphate and a unique probiotic blend, Bravo ‘Ready’ may be beneficial to those who are looking to improve the integrity of the metabolic-digestive tract and heal the symptoms which may have contributed to symptoms of a Leaky gut. This is a ‘made to order’ service. Orders need to be placed no later than Monday 3pm and shipping goes out Wednesday/Thursday. You should receive it Thursday/Friday by 1 PM. Packaging trials confirmed the product remains chilled for a minimum of 24 hours. You may like to leave a coolbox by your front door if you are not going to be home for the delivery but be aware that if you are not there to sign for the delivery the postman may take it back to the post office. Bravo ‘Ready’ is a perishable product. We cannot accept returns. For more information about Bravo Yoghurt and how it can contribute to a healthy balanced diet, please watch Dr Marco Ruggiero Webinar and read more about the development of Bravo Non Dairy. Please ensure you have read our Terms and Conditions prior to ordering. 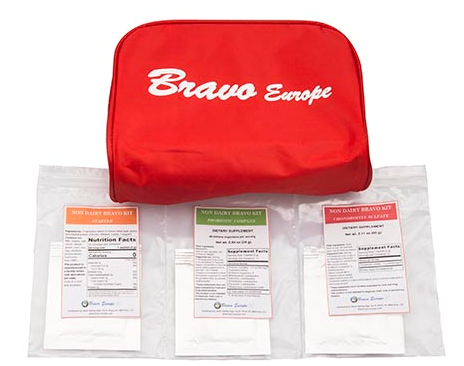 Disclaimer – Bravo products are NOT intended to cure or treat any disease.